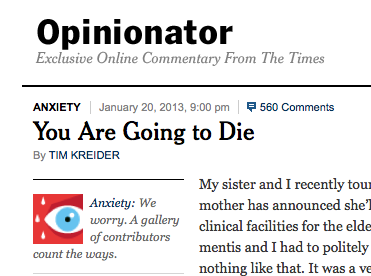 Newsflash: You are going to die. You are here: Home / cut and paste / Newsflash: You are going to die. No, seriously, you are going to die. Man, Debbie Downers blogging at a time near the end of the world! I am going back to the Daily Mail now to find out who’s looking good in a bikini these days, and what Suri’s up to. There is nothing like the third week in January for existentialist angst. Tomorrow is (on average) the coldest day of the year for the northern hemisphere, ya know. Anyway, if you want a whole great theological text on this, read Arthur McGill’s Death and Life: An American Theology. Similar points, placed in the framework that we have made Death the Lord of our Lives. The constant denial of it is evidence of the fearful power it has over us. And that, he says, is kinda the opposite of Christianity, whoopsie. It’s not going to get a nihil obstat (he wasn’t Catholic and there is one statement where he kind of dives over the orthodox cliff) but the rest of the book is excellent. Or you can just wait and read my book should it ever get published, since it has a chapter on death infl by McGill. “Should it ever get published.” Is there a tentative date? In the mind of God, yes. No, it got the nicest rejection ever by Brazos, who said it was indeed ecumenical but just too Catholic and they were afraid Catholics would not come to buy it with their name on it…but they loved it and wanted to publish it. Just can’t. So off to Catholic publishers, who are not publishing academic texts. Hoping mine is the exception.